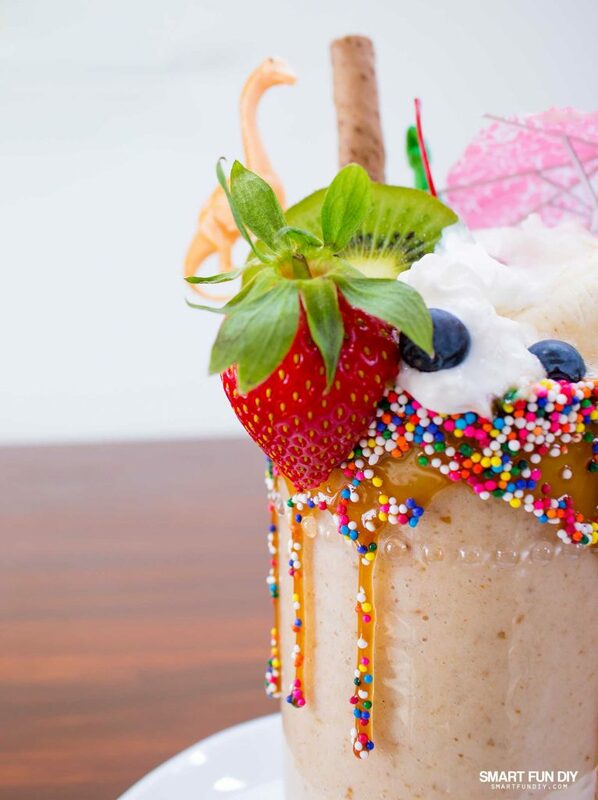 Have you ever seen those EPIC milkshakes, sometimes called FREAK milkshakes, on Pinterest? My kids are all over that trend! 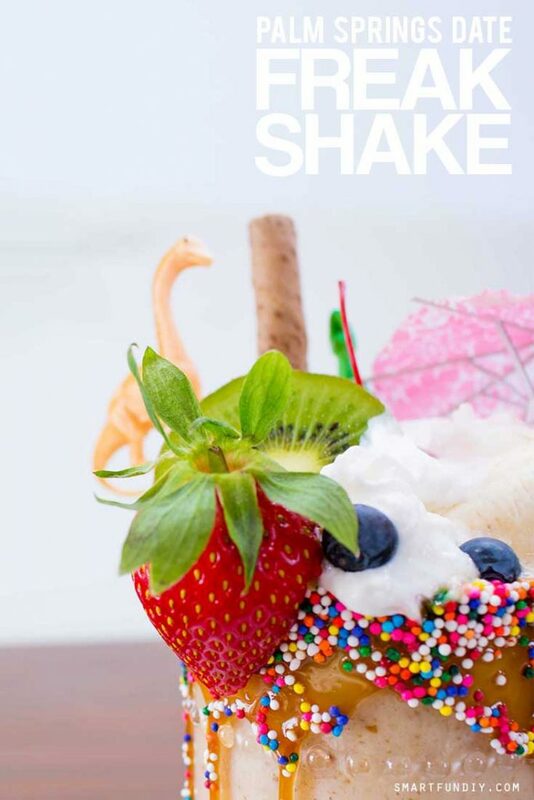 When my friend Jen came to town with her family earlier this year, her kids asked us to find a freak shake shop to visit with them. But the only one I knew of was in Palm Springs, too far away from Los Angeles for our day trip. We skipped the shakes but it got me thinking about Palm Springs. One of the things I remember most from my childhood is stopping in Cabazon, just outside Palm Springs, for banana date shakes with my grandma. Now, it's a favorite tradition with my own kids. 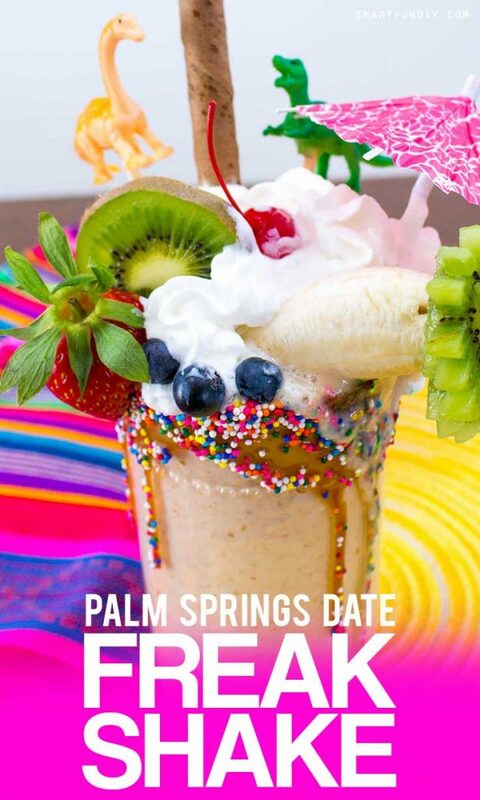 You can't go to Palm Springs without stopping for a banana date shake! So when Lip Smacker announced their Lip Smacker Tastemaker Contest and asked me to make a recipe, I knew I wanted to make an epic take on the date milkshake: a Totally Bananas Date Night EPIC Milkshake! This post contains affiliate links. When you click the link, a cookie is added to your browser. If you make a purchase in a certain amount of time, I may receive a commission on that purchase, at no extra charge to you. Dates and date palms are one of the biggest industries in the Coachella Valley, where Palm Springs is located. 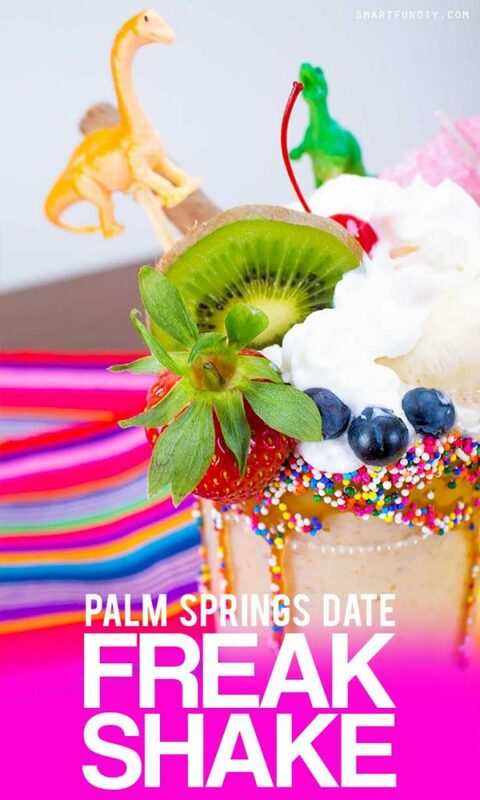 We live about an hour and half from Palm Springs and it's surprising how many of my daughter's teen friends don't know what a date is … and they've never tasted one either. Dates are naturally sweet, even sweeter than sugar! They look like dried kiwi fruit almost, with a shiny exterior. 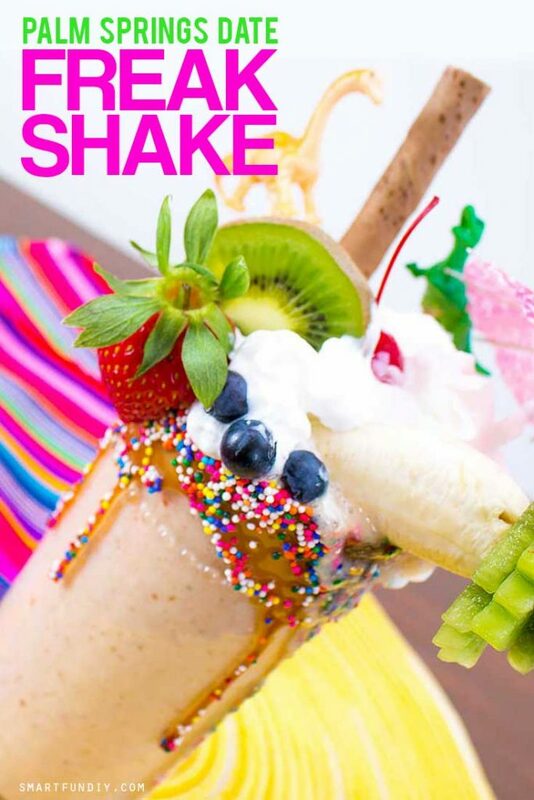 They're used to sweeten all kinds of foods and are great on oatmeal, in breads and desserts, and of course, in shakes. 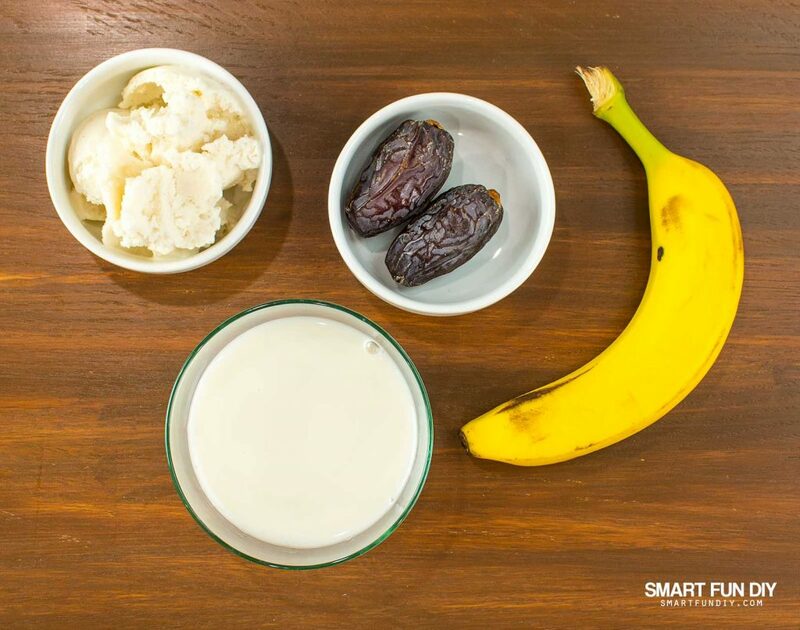 Because dates are SUPER sweet, a little goes a long way. My husband made date banana smoothies for us one morning and he put so many dates in that the smoothies were too sweet for anyone to drink! When I think about Lip Smacker, I think about yummy flavors that make you wanna smack your lips, literally! I remember using Lip Smacker growing up … all the kids had to have all the flavors! When I got one, I cherished it forever and it lasted for months and months. Now my kids and I both enjoy Lip Smacker lip balms… and the designs are so cute, like the new Tsum Tsums. 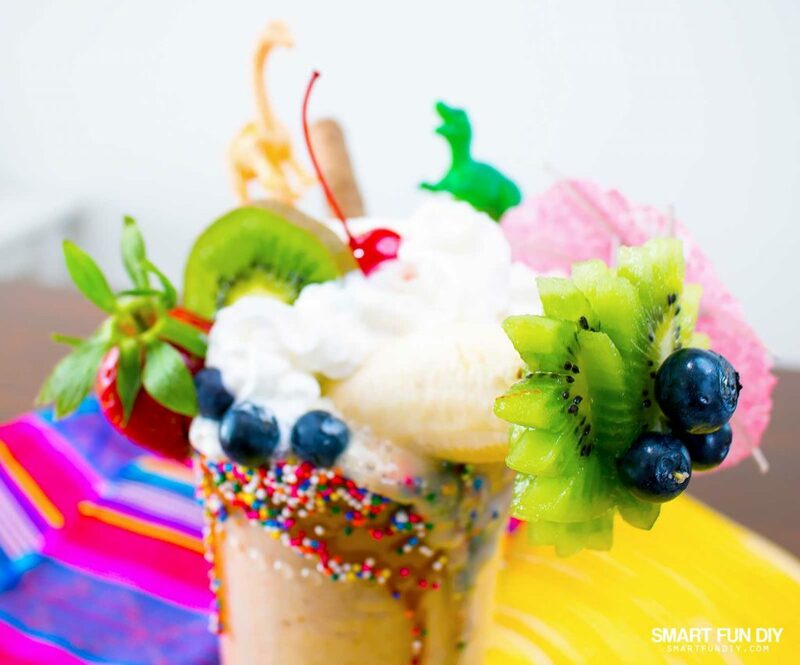 So when I heard about the 2017 Lip Smacker Tastemaker Contest, I wanted to come up with a flavor that was lip smacking and had some special meaning to my kids and I: a Totally Bananas Date Night EPIC Milkshake! My daughter said a lot of kids would not know what dates were so we did a play on the word “date” with a double entendre … “date night”. 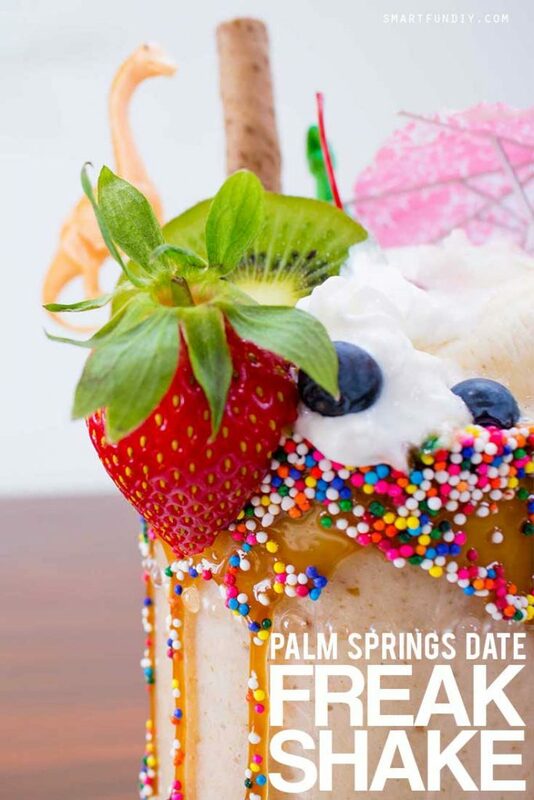 I mean, who wouldn't love a date night in Palm Springs? Have a great idea for a new Lip Smacker Flavor? Enter the 2017 Lip Smacker Tastemaker Contest with your best idea for a chance to become the 1st official Lip Smacker Tastemaker! The winning flavor will be featured on lipsmacker.com in fall 2017 with YOUR NAME in the credits and you'll get a personal batch of hand-crafted, artisanal Lip Smacker lip balms in YOUR flavor. How cool is that?! The contest is over but you can still click the links to check out LipSmacker and get info on any current contests. Dinosaurs – where Highway 111 to Palm Springs meets up with Interstate 10 are several dinosaur statues that have been icons and symbols of this desert oasis. 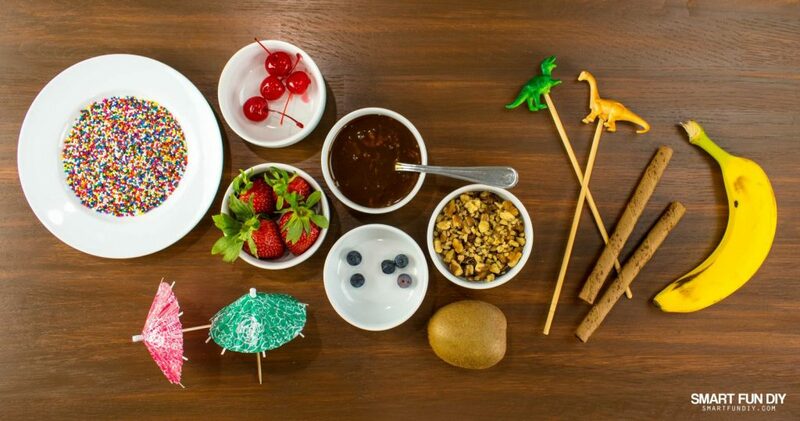 We put toy dinosaurs on skewers to put as decorations in our shake. Banana Palm Tree – It's not Palm Springs without palm trees! We made an edible palm tree out of bananas, kiwi, and blackberries. Cookie Straw – these just look cute! Who doesn't love drinking through a COOKIE straw?! 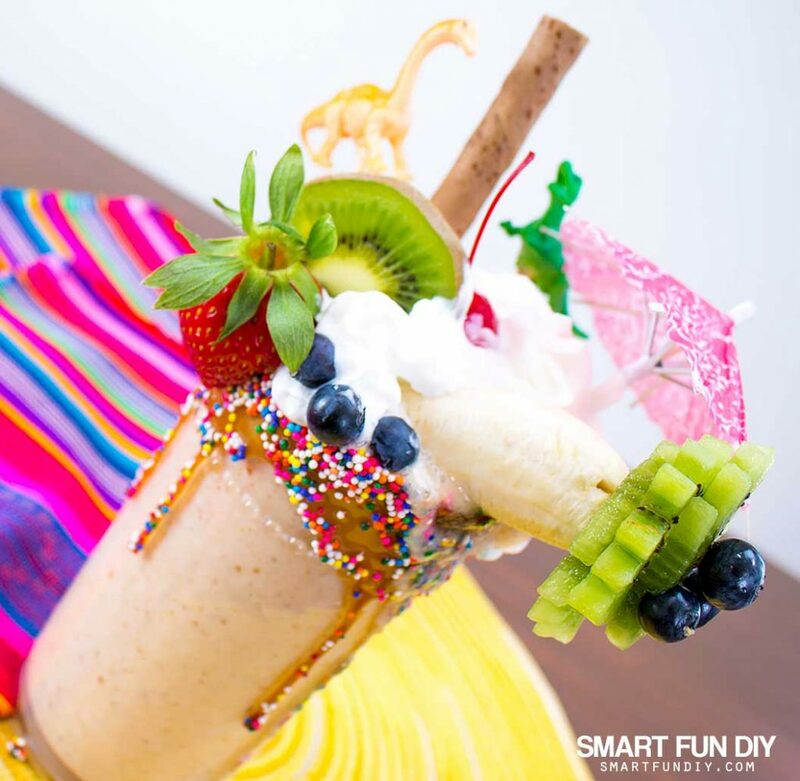 Caramel Drizzle – dates' sugary taste has an almost caramel flavor so this drizzle on the glass not only holds on the rainbow sprinkles but compliments the banana date flavor of the shake. 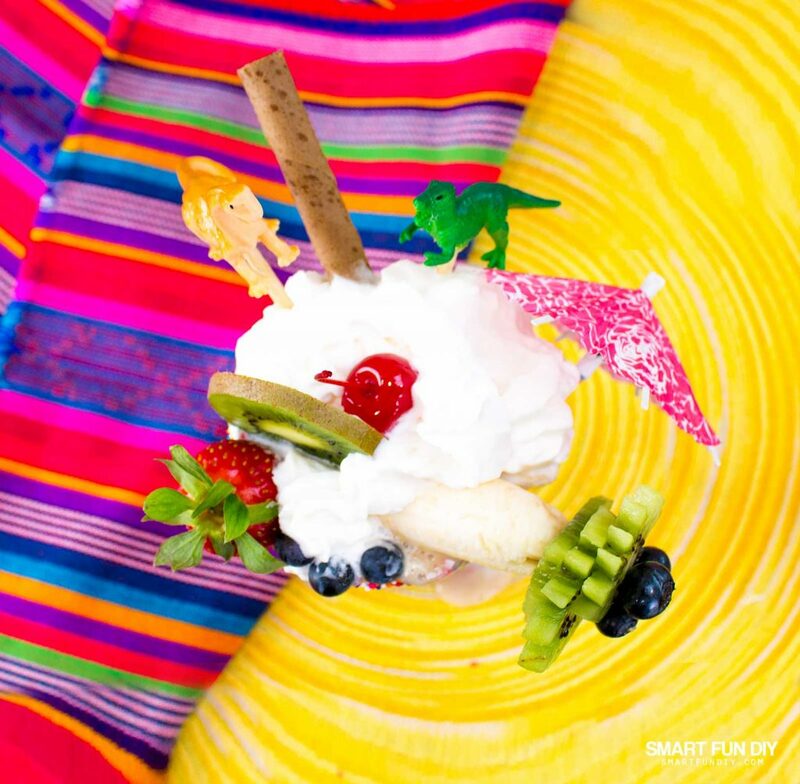 Whipped Cream – every 50's and 60's shake had whipped cream and a maraschino cherry on top. Palm Springs started getting really popular around the 1950s and 60's, that's why so much of the architecture has that retro feel. We made the date shake base vegan compliant so everyone can enjoy it! 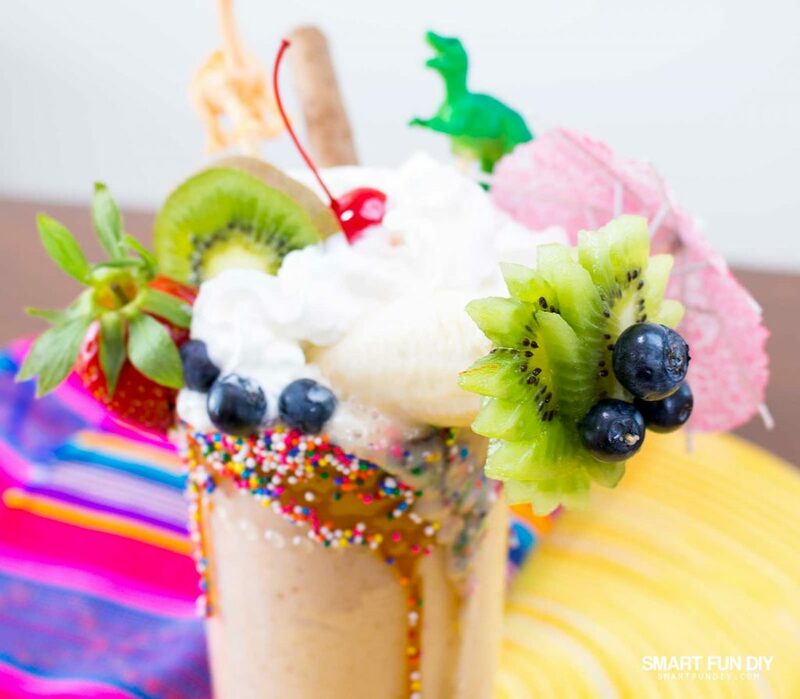 If you're vegan, skip the whipped cream, caramel, and cookie straws in the decorations to keep this shake vegan compliant. 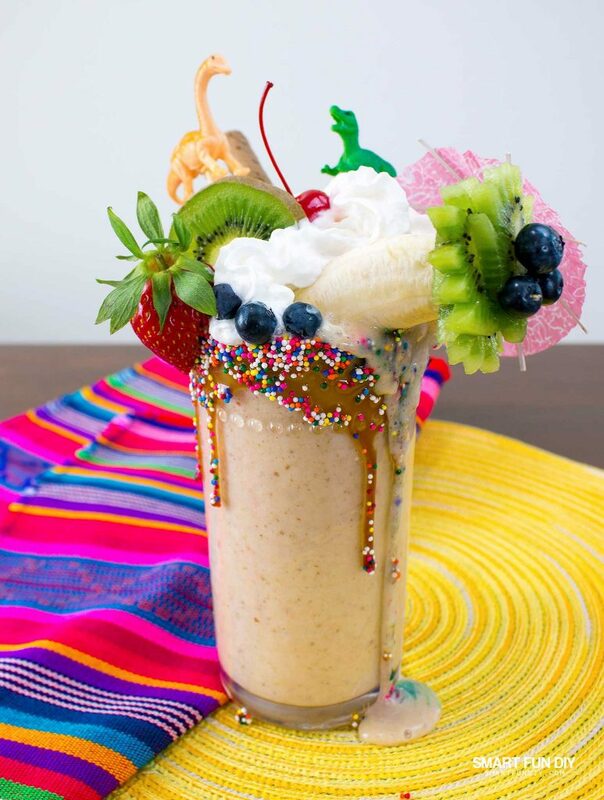 You can substitute regular vanilla ice cream and milk for the vegan ingredients if you would like a full-fat dairy version of this milk shake recipe. Watch this video to see how to make the vegan date banana shake recipe, the fun dinosaur picks, and how to decorate the shake to make it a FREAK SHAKE! Peel banana and chop into chunks. Blend all shake ingredients in a blender until smooth. Once you have the shake base made, it's time to decorate! Again, these decorations are vegetarian but not vegan compliant so make adjustments as needed. 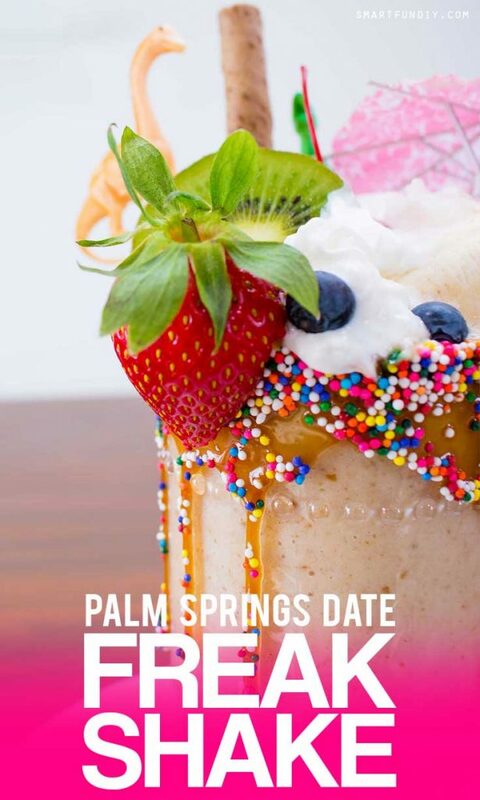 Date banana milkshake inspired by Palm Springs. The shake base is vegan. Toppings are not vegan. Use the tip of a hot glue gun to melt a hole into the bottom of each dinosaur. Add a dot of hot glue to the top of each skewer and quickly insert into the bottom of the dinosaur. Allow to cool. Cut kiwi slices into leaf shapes. Attach to a peeled banana with toothpicks. Attach 3 blueberries to the center of the leaves with a dab of caramel to make a banana palm tree. Use a butter knife to apply a 3/4″ thick layer of caramel along the outside top rim of a tall glass. Roll the top edge of the glass in rainbow sprinkles. Fill the glass with the date shake mixture, just 3/4″ from the top of the glass. Add whipped cream to the top of the shake glass in a pyramid shape. Add the banana palm tree to one side. Cut a slit in a strawberry and add to the opposite side of the glass. Tuck a kiwi slice and a couple of blueberries behind the strawberry, into the whipped cream. Add the dinosaur picks and cookie straw. Enjoy! Jennifer these are so cute. I totally want to make some with my littles. Wow, that is an epic milkshake indeed! It reminds me of those crazy one we have over here in NYC…I forget who they are, the are all over Instagram. I have always wanted one…guess I should make my own!